You will recall that I recently answered a question from Dave T about the chamber of the ankle in the front kick. "I was once showed a front kick where the body is leaned forward towards the target. The kick is similar to the karate version except for the deliberate forward leaning motion of the body. 5. Lastly, related to point 3, with the bodyweight in front towards the target, it makes the kicker less vulnerable to a takedown. Also, if the kicker’s leg is grabbed, his body position allows him to strike/ grab the opponent. Many of the karate forms I know (eg. shisochin and kururunfa) feature a front kick where your body is moving forward as you kick. In such a committed kick, you might well think that the body is "leaning" into the kick. However I hold it to be self-evident that this is not an accurate assessment of such a committed kick. The hip is always pushed into the kick. If it isn't, then there can be no power. And if the hip is pushed into the kick, the body cannot be leaning into the kick. 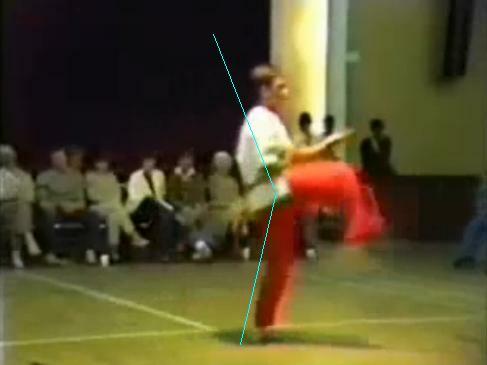 The adjacent images shows my senior, Gordon Foulis, performing the kick in kururunfa. In the first one he is at the start of the kick. And he is clearly thrusting his hips into the kick - note that his hips are forward from his body. 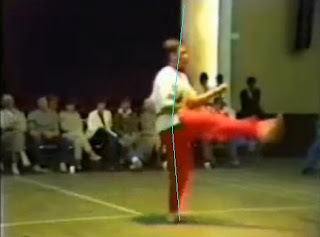 However you will see from the next image that as his kick reaches full extension, the forward movement of his body has caught up, making it appear as if he is leaning into the kick. In a sense it is almost as if the body is being snapped onto the kick rather than the kick being snapped back to the body. Done quickly, this kick can make it appear that the practitioner is leaning into the kick. But in fact the hip is always thrust into the target. And if the hip is being thrust, then the body must lag in accordance with the rules of staged activation of body parts. I hope this answers your queries Dave! I practice the front snapping kick two ways: the traditional Shotokan method as shown in the video at the end of the article, but also in a more standup/lean-in method where I'm using it as a feint/jab to the knee or shin from a "melee" position following with strikes. The hip is still thrusting, but the intent is to off-balance someone in preparation for the strikes to follow. I agree Gerry - those are 2 different kicks and the shotokan one is very much used for greater commitment. However in both, the hip is thrust forward, so the difference is a matter of degree, not form.